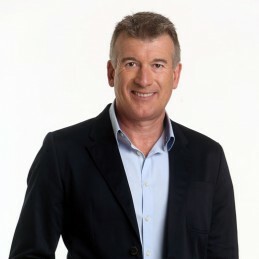 Stephen Quartermain’s career in journalism started in 1980 as a cadet with Leader Association Newspapers. Two years later Quartermain joined the ABC where he would spend three years as a radio and television journalist. During this time he gained experience covering politics, industrial rounds, police rounds and his first love, sport. In 1984 Quartermain joined Network Ten. Career highlights include the 1988 Seoul Olympics, 1989 Ashes tour of England, Wimbledon 1989, World Gymnastics Championships in Germany and Auckland and Canadian Commonwealth Games. Between 1990 and 1995 Quartermain hosted an AFL show which aired in the United Kingdom on Channel 4 and into USA, Canada and 20 other countries via cable TV. In 1991 he co-hosted popular Channel Ten program Sportsweek. Quartermain would go on to anchor Network Ten’s nightly sport report as well as appearing as a regular on evening chat show The Panel as the resident sports expert. He would later anchor Network Ten and Triple M’s coverage of AFL. Quartermain has won several awards for coverage of cricket, AFL and VFA football and basketball. Born in Melbourne in 1962, Quartermain has lived in New York, London and Sydney. In 1991 he married model Julie Nicholson and in 1996 the couple welcomed son Jack into the world. Quartermain is in high demand as an MC for conferences and award nights.